We have a continual growing demand for offering life-time testing for our customers. In order to stay on the forefront with our good testing facilities, we have invested in an additional new life-time tester that can test vertical movements. 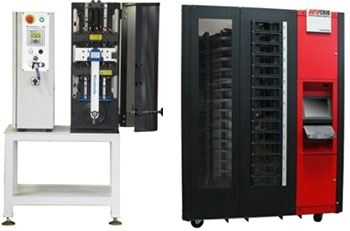 We test in two ways; either in a number of cycles required by the customer or until the first spring breaks. In order to keep track of our machine tooling and dedicated measuring tools we have set up a machine to handle this. We assure in this way that we have easy access to the tools needed, coiling fingers, feeding rolls etcetera for manufacturing your springs. We are also reducing costs in this manner. In our effort to optimize our production and expand our capacity, we are always looking for new development possibilities. This has resulted in a new investment in an additional new “inline setup” with coiling machine FUL35 with 3D coiling finger and an inline annealing furnace so we can meet the demand from the market. This year has started better than expected. Our success is due to a good development in existing customers but also to a growing number of new customers. We are happy to be acknowledged for our expertise and our ability to always produce very uniform and high quality products, delivered in agreed-on time to competitive prices. 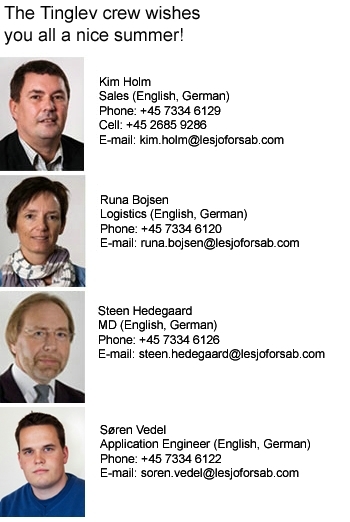 We also experience the positive aspects of being part of the Lesjöfors Group. Hereby we can offer our customers almost any spring solution and secure the same quality and delivery service by being key account responsible for our customers. Our aim is to give you the best possible service in order to help you with serving your customers in the best way. Open during the summer holiday period, with reduced staff. In order to stay a healthy business, healthy and well-motivated employees are required. We have educated a Health Ambassador, who helps our employees to achieve their personal goals. The company supports this by offering fitness activities to reduced prices, an active mountain bike club (the challenge here is to find mountains in Denmark, but we do have hills and very good mountain bike routes in southern Denmark), walking three times a week as well as a jogging club every Friday. Lesjöfors has production or sales offices in eleven countries: Denmark, Sweden, Norway, Finland, Germany, Slovakia, Great Britain, Holland, Latvia, Korea and China.